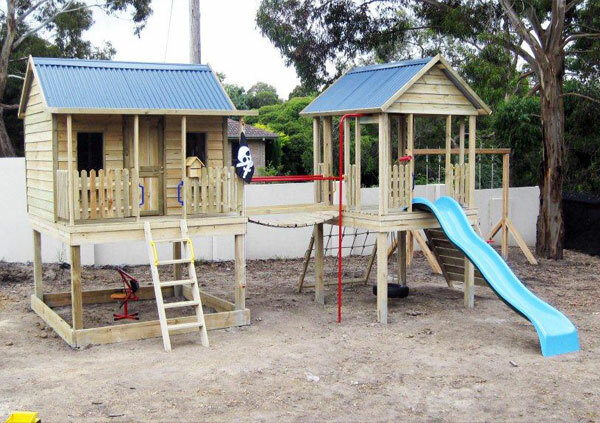 All of the wooden products in our range can be custom built in a range of combinations, including elevations, connecting platforms, swing assemblies and monkey bars, or ask us for a quote on a customised product of your own design.The styles below are just a small selection of what is available, with more photos of custom styles coming soon.Pick up can be arranged from the factory and transport quotes are available on request or you may choose to organise your own transport. The Club House Manor – Image 1. Includes the 2.4 X 1.8m Club House with 0.7m veranda, two front windows with sliding clear acrylic panels, standard front door, letter box, 2 planter boxes and is clad with kid safe ACQ treated pine. 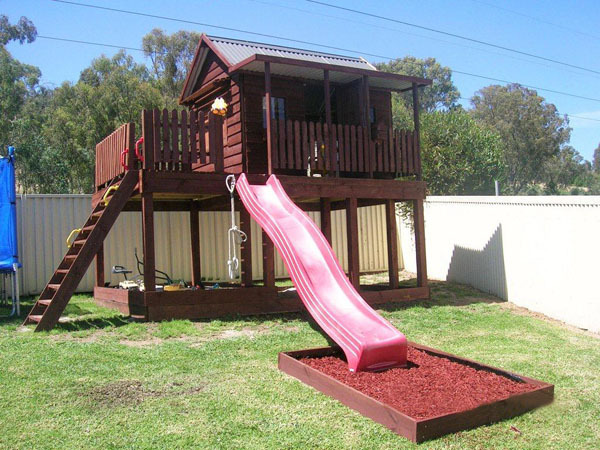 It has a Colorbond roof with your choice of colour from the Colorbond range. The Club House is elevated to 1.5m and has a 2.5mX1.5m deck on the side. There is a Shop Side Servery complete with outward opening hinged black board doors, internal desk and external awning, a 3.1m wave slide with a sand pit (1m X 2m) at its base. The 1.5m elevation includes 10 off 100 X 100mm Cyprus Pine posts, 150X25mm treated pine plinths around the top, an access ladder and 2 sets of coloured handles for the steps -top and bottom. There are picket fences around the side platform and veranda. The Club House component is 2.4mX1.8m with an additional 0.7m veranda. It comes complete with 2 front windows with clear sliding acrylic panels, standard door, picket fence, letter box and 2 planter boxes. It is clad with Kid safe ACQ treated pine and has a corrugated iron Colorbond roof. The Club House is elevated to 1.5m with 100 X 100mm Cyprus Pine posts and has treated pine plinths at the top. There is an access ladder to the side or front. Picket fences cover all areas of the veranda except the ladder access and there is a solid bridge with picket fences to access the Fort. The Fort component is also elevated to 1.5m with a 1.8 X 1.8m treated pine deck, picket fence side walls and a Colorbond roof. 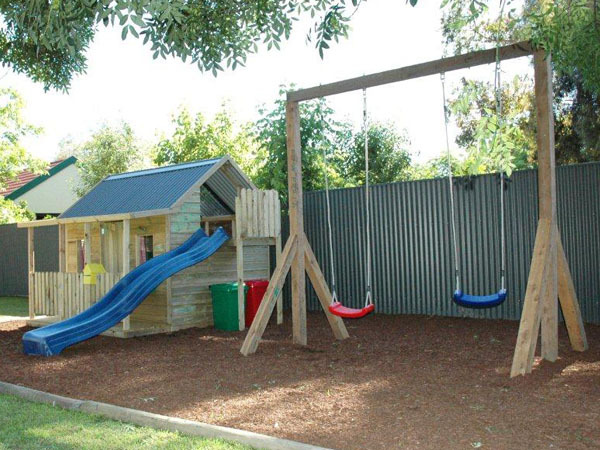 Elevation is on 100 X 100mm Cyprus Pine posts and it comes complete with a 3.1m wave slide, rock wall and climbing net. In addition, the Fort has both a Steering Wheel and Periscope and to top it off there is a Fireman’s Pole and Pirates Flag . Please note our Club House Manor and Elevated Club House – Fort Combo , like all of our timber products, can be upgraded to include many options and variations including those below.